Below are a few examples of my editing and writing work. Tōtara by Philip Simpson (Auckland University Press, 2017). This is one of a succession of ‘tree’ books by Philip, covering every aspect of the tōtara, from botanical and ecological to cultural/historical. The book was shortlisted for the Ockhams Illustrated Non Fiction Award 2018. Fearless by Adam Claasen (Massey University Press, 2017). One of many titles produced to mark the centenary of the war, Fearless remembers the New Zealanders who dared to go into the air in flimsy machines to fight for their country. A fluent and readable work, all the more remarkable for being pieced together from contemporary news reports, Fearless was longlisted for the Ockhams Illustrated Non Fiction Award 2018. Strangers Arrive by Leonard Bell (Auckland University Press, 2017). The lives and careers of some of the artists, photographers, writers, critics and architects who fled totalitarian regimes in Europe for a new start in New Zealand. As others did in the US (Mies, Gropius, etc. ), these émigrés added a distinctively ‘other’ flavour to our local culture. Strangers Arrive was shortlisted for the Publishers’ Association NZ Book Design Awards 2018. Tū Arohae: interdisciplinary critical thinking by William Fish and Stephen Duffin (Massey University Press, 2017). Bill and Stephen have written what the publisher calls a ‘handy critical-thinking toolbox’ to help enquiring minds test the validity of any statement. It’s a timely book for this era of so-called fake news! Over the past three decades I have written hundreds of partwork articles on a diverse range of topics, from aardvarks to art. I’ve written more than a dozen non-fiction books, for clients including Blackwell & Ruth, Penguin Random House NZ, Dorling Kindersley, Heinemann and New Holland. Red Power: 175 years of Case IH tractors in New Zealand (Imagination Press, 2018). I wrote the text and took many of the photographs for this commemorative corporate book. The client engaged me to travel New Zealand from top to bottom and interview farmers, contractors and tractor enthusiasts. It was huge fun, and I got to meet interesting people in stunning locations. Endangered by Tim Flach (Blackwell & Ruth / Abrams, 2017). I wrote the back-stories in this massive-format photographic work. Lyrically charged essays by Sam Wells punctuate the photography, while my ‘thumbnail’ texts carry the detail behind each species’ circumstances in the wild. The writing, stretching over a couple months, required an intensive period of research into each animal to distil the information into powerful stories. Starship: Inside our national children’s hospital (Random House, 2014). I ghostwrote this title, working closely with the editor, oncologist Lochie Teague, and other staff from the hospital. It provided a fascinating insight into a world that, frankly, most people hope never to see. Having had a short-run printing, the book is no longer available from the publisher but can be found online. Rail: 150 years of rail in New Zealand (Penguin Books NZ, 2014). I wrote and picture-researched this big, glossy hardback, and had the luxury of a long shopping list of images to dig out from various archives around the country. 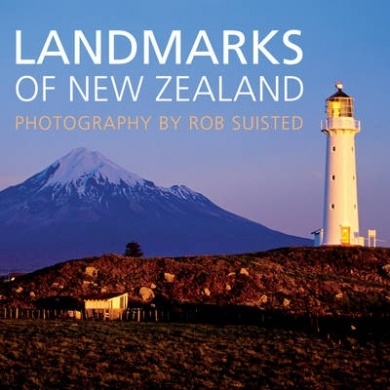 Landmarks of New Zealand / Wildflowers of New Zealand / Wildlife of New Zealand (New Holland Publishers NZ, 2010/11/12) are three little pictorial books by leading NZ photographer Rob Suisted to which I contributed text and captions. Rob runs an excellent photo library of New Zealand nature. Below are samples of my writing for partworks. The first piece was one of a hundred that I contributed to a collection on masterpieces of western art. 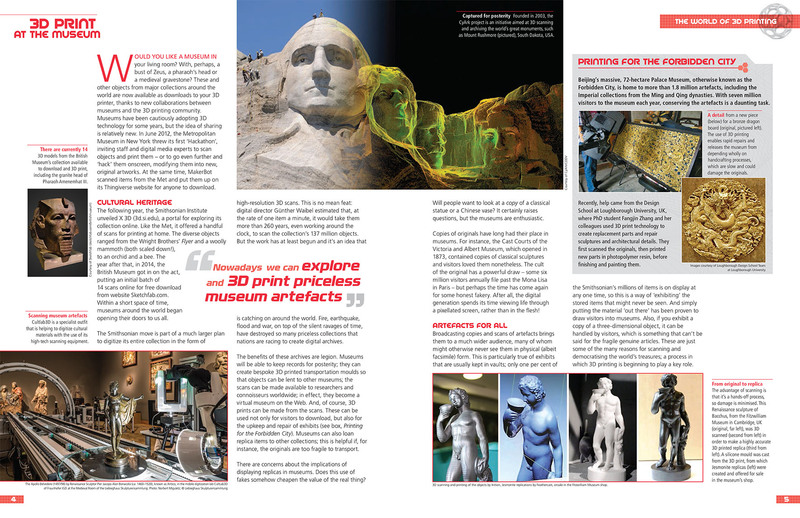 The second was for a 3D-printing publication, which was so successful that they commissioned an extension to the series.